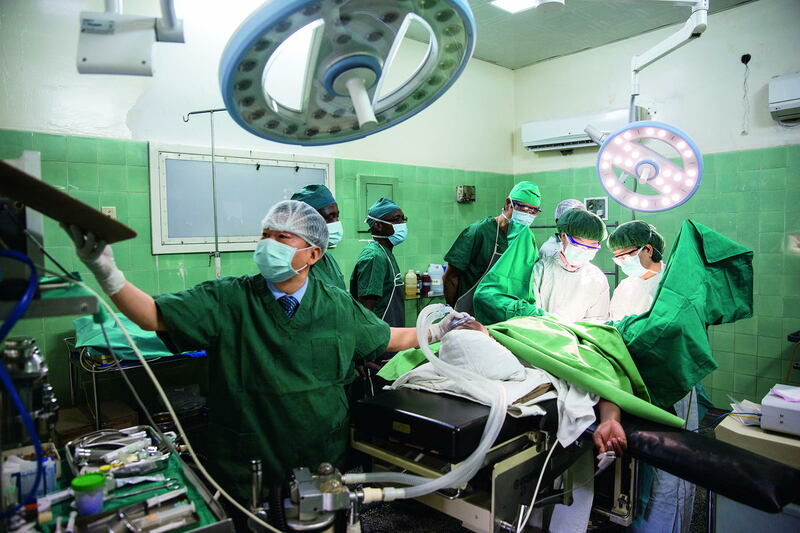 Chinese doctors perform surgery on a Zambian patient in the operating room at the China-Zambia Friendship Hospital. On June 23, 2018, Sari Ma, a 30-year-old Zambian mother, brought her fourth child to the China-Zambia Friendship Hospital for a follow-up checkup six weeks after delivery. She was examined by Chinese doctor Li Hailian, director of the Department of Gynecology and Obstetrics at the hospital. Li came to the China-Zambia Friendship Hospital in 2005 with her husband Qin Xisheng, deputy general manager of the China-Zambia Economic and Trade Cooperation Zone and president of the hospital. Before their arrival, the region lacked any local gynecologist and obstetrician, and the maternal mortality rate was painfully high due to meager medical conditions. Chinese doctor Li Hailian, director of the Department of Gynecology and Obstetrics at the China-Zambia Friendship Hospital, gave Sari Ma, a 30-year-old Zambian mother, a follow-up checkup six weeks after delivery. However, since Li Hailian arrived, the Department of Gynecology and Obstetrics and has transformed into a leading department of the hospital. Not only do they strictly screen pregnant women with HIV and treat them for free to reduce the risk of mother-to-child transmission, but her team also diagnoses and treats local women for high-risk pregnancy. Liu Yueqin came to Zambia in 2015 after retiring from the China Nonferrous Metal Mining (Group) Co., Ltd., known as CNMC for short. Now, she serves as administrative manager of the China-Zambia Friendship Hospital. “Our hospital is the only one in Zambia with zero maternal death, and we also have the lowest infant mortality rate,” she said proudly. Located in the city of Kitwe, the China-Zambia Friendship Hospital sprouted from Nkana Mining Hospital, which was established in the 1930s. After closing for many years due to mismanagement, the hospital was acquired by NFC Africa Mining, a subsidiary of CNMC in Africa, in 2000 and renamed China-Zambia Friendship Hospital. For its long-term development, the hospital was transferred to a medical institution under the management of the China-Zambia Economic and Trade Cooperation Zone in November 2009. Medical resources in Zambia are quite limited. The China-Zambia Friendship Hospital has played an important role in improving local medical services capacity. 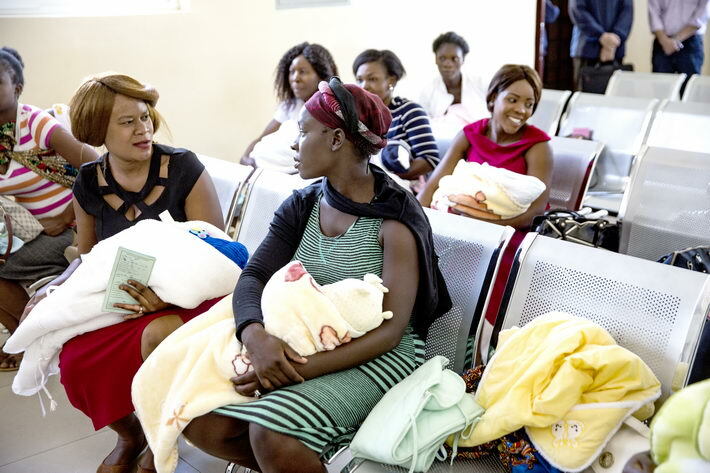 Zambian women wait for doctors’ calling for reexamination outside of the Department of Gynecology and Obstetrics, the busiest department of the China-Zambia Friendship Hospital. 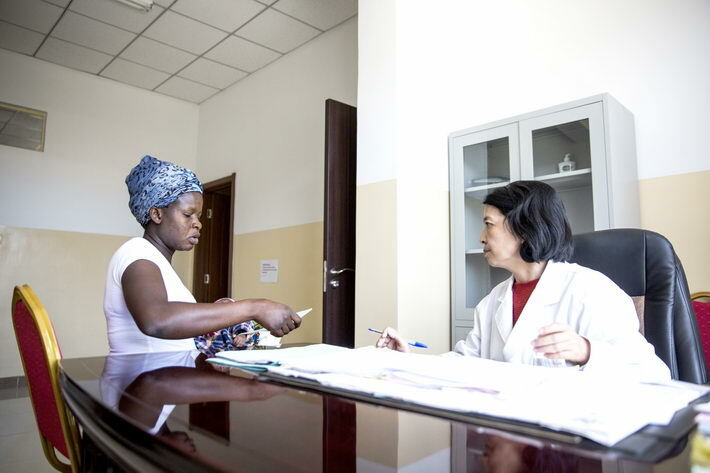 The hospital not only provides medical services for Chinese employees of China-funded enterprises in Zambia, but also offers free treatment to local employees and their families. Thanks to the impressive development of the hospital, increasing numbers of locals come there when in need of medical treatment. However, the development of the hospital only progresses through efforts of the whole medical team. A total of seven Chinese doctors at the hospital work with more than 10 Zambian doctors and nurses. Major operations and diagnoses still depend on Chinese doctors. Although there is a basic division of labor, some situations require anyone available to help out from time to time. Gradually, every doctor was certified as a general practitioner. 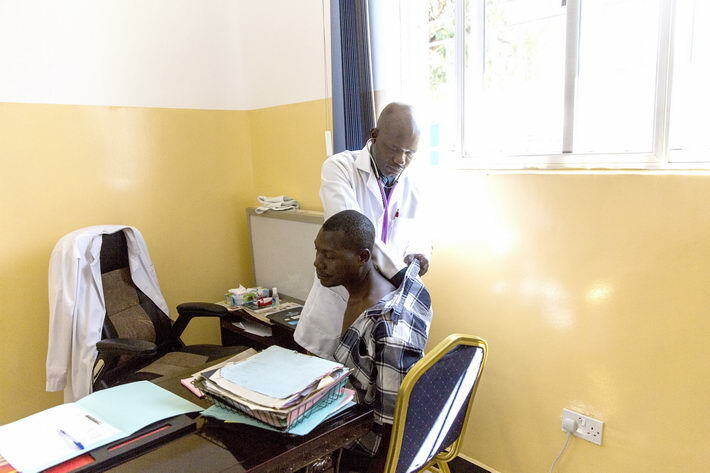 A Zambian doctor at the China-Zambia Friendship Hospital gives a physical examination to a local man. Su Zhibing, director of the Department of Anesthesiology and assistant to the president of the hospital, came to Zambia in 2010. Not only is he an anesthesiologist, but he also oversees management of the hospital’s wards and pharmacy. Once, when Li and Qin were performing a surgery on an HIV-infected patient, Li accidentally knocked a pair of scissors from Qin’s hand, which fell through Qin’s shoe and stabbed his foot. “When it happened, we didn’t care much about it and went on with the operation,” she recalled. “When the procedure was completed, I realized he should rush for an injection.” Fortunately, Qin wasn’t infected. But since then, surgeons are all required to wear hard-rubber shoes in the operating room. 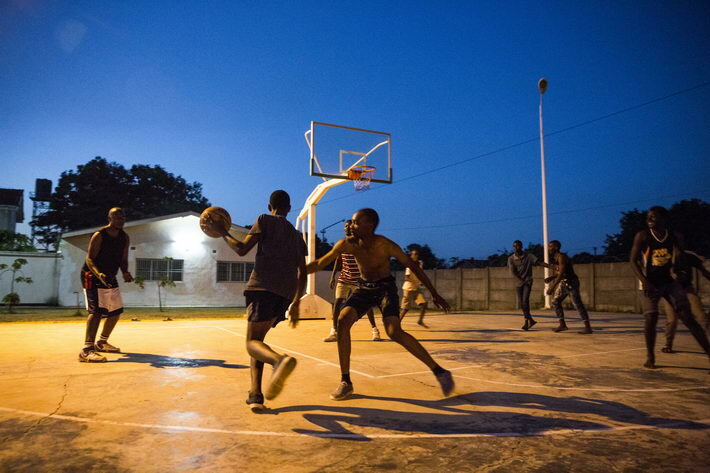 Some medical workers play basketball at the living area of the China-Zambia Friendship Hospital. For Chinese employees in Zambia, the hospital is their harbor and shelter in the foreign country. On May 19, 2005, a Chinese employee of a Chinese-funded enterprise was injured severely during construction work. An injury to his head led to an intracranial hemorrhage and coma. Qin immediately organized an emergency rescue. After the operation, he worried that the patient’s difficulty in speaking would making nursing more difficult and negatively impact treatment, so he personally took care of the patient for more than 20 days until he was out of danger. Many local people can’t afford the bills, but Qin always gives them a steep discount or free treatment. In fact, of all the medical institutions in Zambia, the China-Zambia Friendship Hospital charges the lowest for medical services.